Last month I blogged about the 70th anniversary of the opening of Manzanar, a concentration camp in southern California. Grace Ito Coan, a member of Sacramento Friends Meeting, was among the U.S. residents of Japanese ancestry imprisoned there from 1942-1945. Her story in Western Friend put a personal face on disgraceful actions of the U.S. government. 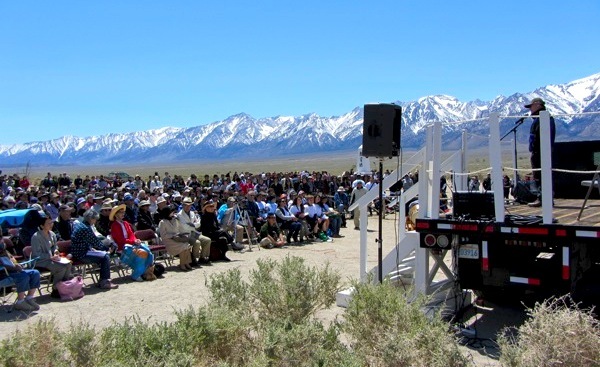 This weekend, while I gathered with Quakers at Pacific Northwest Quarterly Meeting, I thought of the people participating in the 43rd Annual Pilgrimage to the site of the camp, designated twenty years ago as Manzanar National Historic Site. Zach Behrens, Editor-in-Chief, Blogs at KCET, wrote about his plans to attend: The Importance of Visiting Manzanar. A video from the 2011 pilgrimage ( Manzanar Pilgrimage) as well as Twitter posts from this year’s event (http://twitter.com/#!/manzanarcomm), gave me a sense of what happened there this weekend. And it reminded me again of the cruelty of fear. Remembering is an important step toward making sure such discrimination never happens again.